Already supportive of many of Jonesboro’s nonprofit organizations and charitable events, First Community Bank employees began looking for ways to deeply impact the future of the community for many years to come. Last year, with the introduction of the Piggy Bank Program, the bank hopes to do just that by going into area schools and teaching youth how to start saving now for financial stability later in life. Three years ago, Gabe Roberts, an AVP loan officer who has been with First Community Bank for two years and in banking for seven years, had a conversation with his father, a school principal in Jonesboro, about how kids today need to be better equipped with financial knowledge once they enter the real world. He approached First Community Bank’s Vice President of Retail Banking, Brian Emison, who quickly jumped on board after hearing Roberts’ idea. Roberts says the aim of the Piggy Bank Program is to enable children to have the independence to make financial choices and guide them in ways to manage their money effectively. The lessons center around content like differentiating needs and wants, setting attainable long and short-term goals and how to make a functional budget. First Community Bank is the first bank in the U.S. to sponsor the Piggy Bank Program and is committed to improving the financial literacy of the children within the Jonesboro area. The curriculum they are implementing is based on common core standards in English, language arts, math and social studies/economics. The curriculum also includes interactive lessons and in-class discussions to keep the subject fresh and engaging to students. 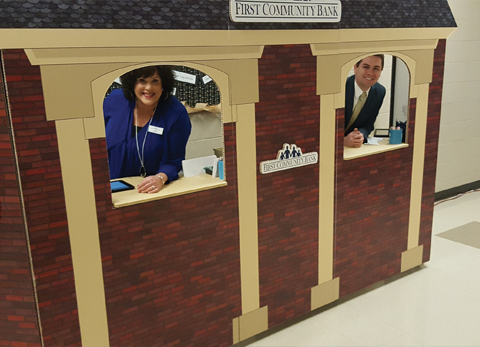 Each week, Roberts, Emison and Southwest Drive Banking Center receptionist Leisa Hartl go to the schools, open the Piggy Bank and introduce students to the banking experience. They accept the students’ deposits, teach them how to fill out their deposit slips and help them keep track of how much money they are saving. There is even an app so the kids can log in online with their parents to monitor their savings goals, both short-term and long-term. Emison says it’s important to support children who are participating in their school’s Piggy Bank program by having them do chores, rewarding them for an excellent report card or matching their savings once they reach their goal so they can learn the importance of saving. By involving families with what the students are learning as part of the program, the bank hopes that the results will be far-reaching. “According to census information, of the 18,652 children in our education system in Craighead County, 65.8 percent of those students qualified for free or reduced lunches,” said Roberts. “Hopefully, the effects of the Piggy Bank will be long-reaching, and ultimately the Jonesboro community will have a lively and thriving economic environment due to the groundwork laid by the bankers and teachers who devoted their time and energy to the project and its successful implementation. Statistics show that having a college savings account containing even a single dollar will increase the likelihood of a child attending college from 45 percent to 71 percent. It isn’t about the amount of money the children can put back, but setting fundamental values for our children to make wise decisions with the funds at their disposal. I believe the combination of the weekly visits to the Piggy Bank and the course curriculum will not only instill financial knowledge for the students, but this program will also have an impact on parents. “… The Piggy Bank Program has massive potential for growth by branching out to other school districts and grades,” said Roberts. He encouraged any school district interested in implementing a Piggy Bank Program, to reach out to the bank. For more information about First Community Bank’s Piggy Bank Program, call (870) 932-5600.